Jerky Snob is an artisan jerky monthly subscription box that sends artisan jerky from small-batch producers across the US. All the jerky is free of MSG, nitrates, nitrites, and high-fructose corn syrup. Cost: $27.00/month for 1/2 lb box. 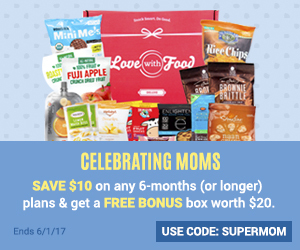 $54.00/month for 1 lb box. What you get: 3-4 bags of artisan jerky in the 1/2 lb box. 6-8 bags of artisan jerky in the 1lb box. I bought the 1/2 lb box of this jerky for my husband and I to try out. He’s been trying to eat a higher protein diet and I thought this would be a good snack. In the box there were 4 bags of artisan jerky. 3 beef jerky and 1 turkey jerky. The two featured artisans in this box were Sweet Meat Jerky based out of Nashville TN. and Chef’s Cut Real Jerky based out of Naples, FL. When you sign up for Jerky Snob you get to choose either 1/2 lb or 1 lb of jerky, a mix of mild and medium jerky flavours and you also get to choose if you get all gluten free jerky or a mix of regular and gluten free. My choices were 1/2 lb , a mix of mild and medium and a mix of regular and gluten free jerky. 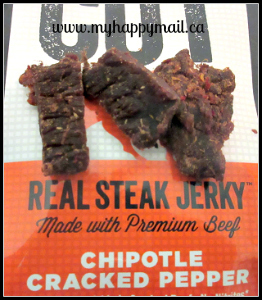 This Classic Beef Jerky turned out to be my favourite one this month. 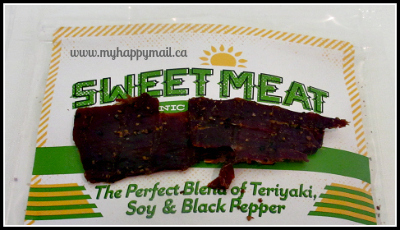 The flavour was perfect (a blend of teriyaki, soy and black pepper) and the jerky was tender and not too chewy. The one thing I hate is jerky that hurts my jaw to eat! This was some of the best jerky I’ve had. 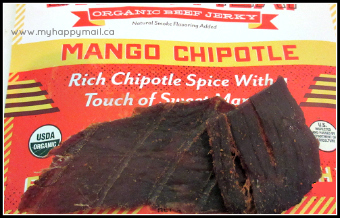 Mango Chipotle Beef Jerky is described as rich chipotle spice with a touch of sweet mango. the flavour of this one was exactly as described. The slight sweet touch at the end was great. 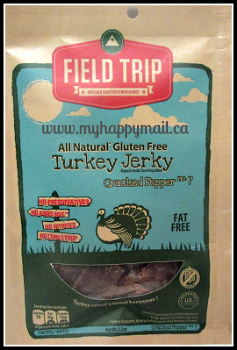 This particular jerky was gluten free and I found it to be a bit tougher than the classic one, delicious jerky though. Never have I ever had real steak jerky before it’s really tasty. The flavour was chipotle cracked pepper and this was definitely the spiciest flavour in the box. The jerky pieces were small which I liked and thick just like real steak. I’d love to try out some of their other flavours. 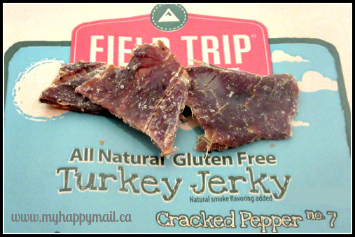 Turkey Jerky! I didn’t even know they had such a thing. This turkey jerky was cracked pepper no. 7 flavour, I found it fairly spicy. It was also gluten free, the pieces were small and fairly thin. 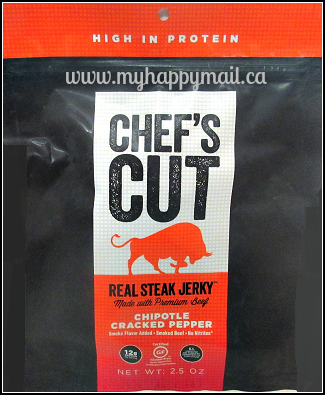 I really liked the flavour of this jerky but I found the texture to be a bit too tough for me. I really enjoyed this Jerky Snob subscription box. I think for what you pay you get a great assortment of quality jerky. 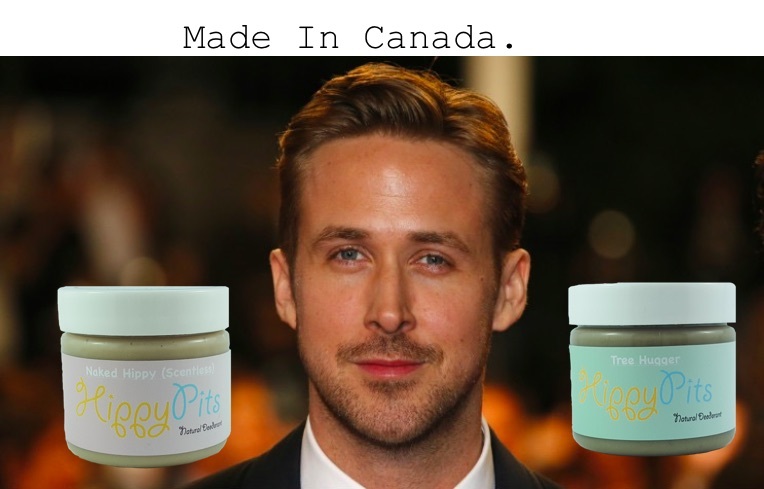 I’m sure that you will notice a huge huge difference in the flavour and textures of these premium jerkys when you compare them to the regular grocery store brands. If you are a jerky fan you should definitely check out this subscription you won’t be disappointed. If you aren’t a jerky fan and you have never tasted premium artisan jerky you might be surprised to find out you actually like it and are just a jerky snob. Click here to visit their site to find out more. What did you think of Jerky Snob? I’d love to try the Classic Beef Jerky. Sounds delish! 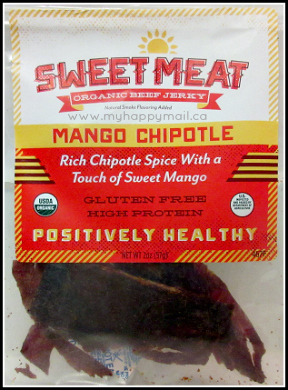 I love spicy stuff I’d love to try the Mango chipotle ? Yummo!! We love jerky in this house!! I will have to get some flavors for my hubby for Christmas!! I love jerky. Last night I was telling my 3 family members that shot deer I wanted deer jerky if anyone was making it. Never heard of most of this jerky. This would make such a great gift… for myself… hahaha I looove jerky and that this box gives from smaller companies that don’t have MSG… that is phenomenal! 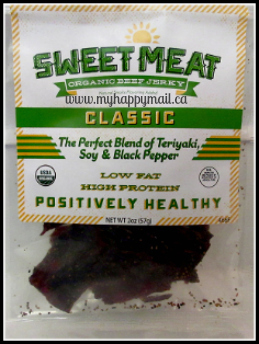 I love jerky but have a sensitivity to MSG. This is great, thanks for sharing! It looks really delicious! The price seems a little too much for jerky, though.